Suncatchers are awesome. We love making them because we like pretty things. 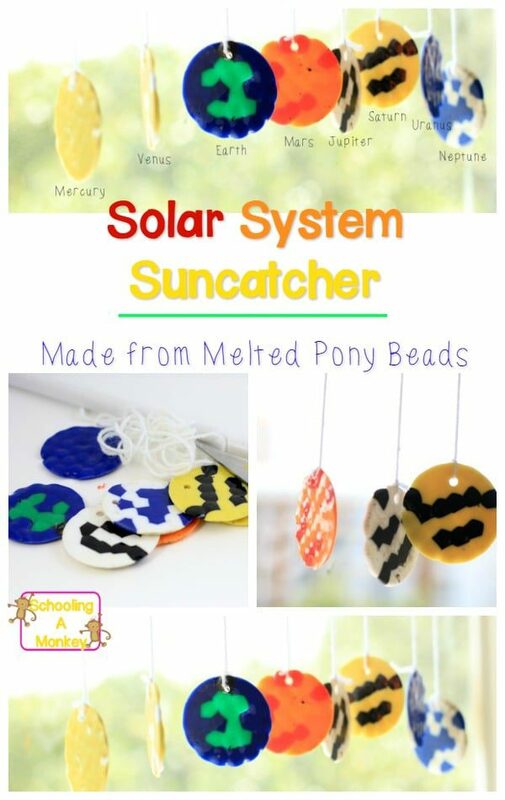 The best thing about suncatchers is that they are usually pretty easy to make, like this melted pony bead suncatcher we made to look like a solar system mobile for a fun STEM activity for kids! 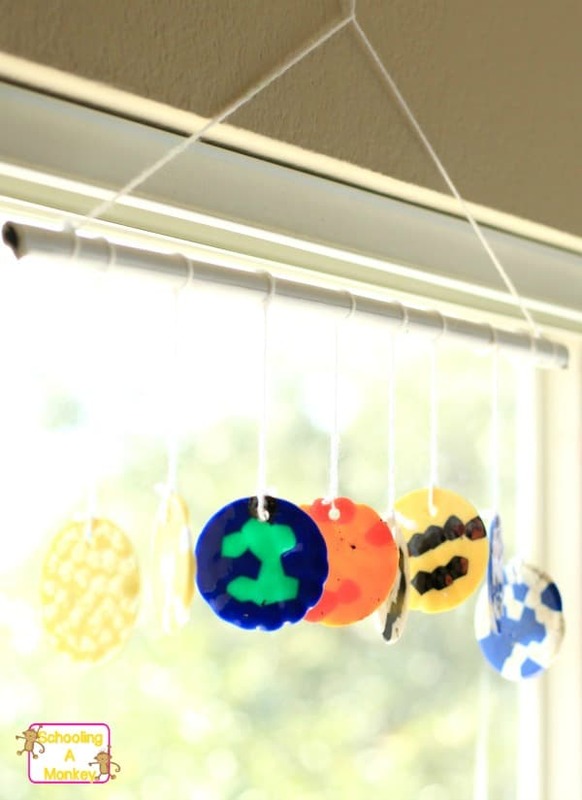 It’s one of the many ways we’re having screen-free fun this summer and one of our favorite solar system projects for kids! Try this project when planning your thematic units for the summer! We wanted to make a melted pony bead suncatcher after seeing how awesome this melted bead craft turned out from The Artful Parent. We didn’t have any clear pony beads, so we decided to transform our art project into a STEAM project instead and make solar system projects for kids instead by making a planet craft! First, look through the pony beads and find beads that match the colors in the solar system to make pony bead patterns for each planet in the solar system. We couldn’t find exact matches for the solar system craft in our stash, so we just approximated. We made rings for Saturn by adding two stripes of beads to our muffin pan. Fill the bottom of each muffin pan with beads. The order you put them in the pan will be how they look when they melt. The pony beads do not move. Heat the grill outside to about 350 (medium heat) and place the muffin tin on the grill. Close the lid and wait about 10 minutes. The beads might take up to 30 minutes to melt, but you will want to watch it. If you let the beads cook too long, they will turn brown and bubble, which looks terrible. As soon as the beads start to melt and smooth together on the top, remove them from the heat. Let the beads cool about 10 minutes, then pop them out of the muffin tin. Your planet mobile is well on its way to completion! 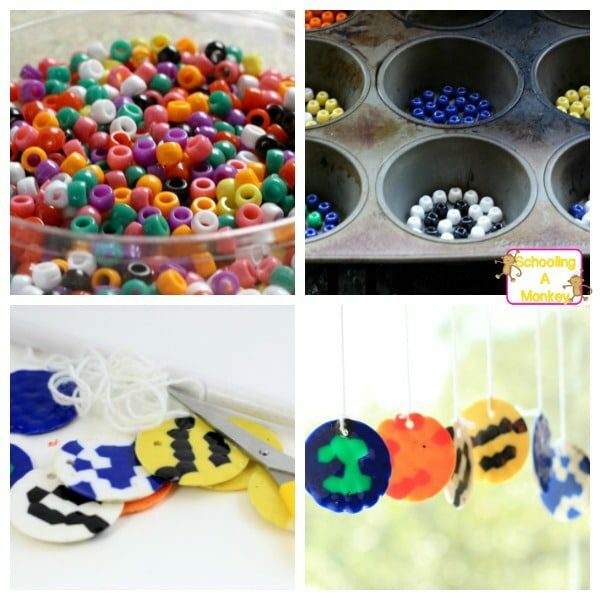 Drill a small hole in the top of each pony bead suncatcher with your drill. Tie a piece of yarn to the top of each planet and tie the other end of the string to the cardboard hanger. We hung our planets in order as if the sun was on the left, so the first planet on our string was mercury. Remove the metal part of the hanger and tie a longer piece of yarn to each end of the cardboard tube. Hang the planet melted pony bead suncatcher in a window that gets lots of sun. The light will shine through the suncatcher craft and the planets will look like they are glowing.